NVIDIA's mid-range, HD 5770-killer is here. Can it live up to its billing? This overclocked version beats the HD 5770, but is still only a tenner shy of the superior baby GTX 460. The GTS 450 is the latest in Nvidia's burgeoning DX11 graphics stable. Coming hot on the heels of the superlative GTX 460 this new card has got a lot to live up to. Nvidia has a history of making the biggest, fastest most monolithic of PC graphics cards. The bleeding edge has always been the technology that's made the big splashes in the tech press, but equally it's Nvidia's mid-range cards that have arguably been more important. With the release of this latest GF106-based card, the GTS 450, it's tackling the mid-range with its lowest-priced Fermi card yet. Nvidia has a habit of making big splashes in the mid-range pool; the likes of the 6600GT and especially the phenomenal 8800GT have cemented their place in the hearts of PC gamers for years. 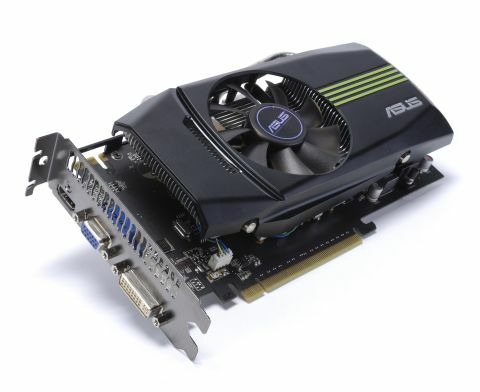 And last month saw the release of a Fermi card that can quite happily sit at that top table, the GTX 460. In 1GB trim, and with some judicious waving of the overclocking stick, the GTX 460 has managed to single-handedly render all cards in the £150-£300 price range effectively obsolete. That's including Nvidia's own GTX 470. When you drop a couple of these into an SLI setup too you're then talking about a system which will happily give a GTX 480 /and/ AMD's top card, the dual-GPU HD 5970, a damn good thrashing. For a lot less cash too. But that still leaves a gap in the market under that £150 mark. And that is a place that AMD has had sewn up for a good long while. The HD 5770-shaped shadow that looms like Arthur C. Clarke's monolith over that price point has been doing so for almost a year now and finally Nvidia has got a product to give it a run for its shader count. This is where we're getting into volume territory. The sub-£150 pricepoint sees some of the biggest number of sales of all graphics cards, certainly more than the rather niche top-end beasties. A lot of folk want an HD 5770 then, and from the look of the GTS 450 Nvidia is one of them.